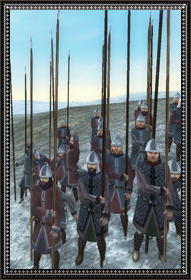 Kontaratoi are recently entered into service by Manuel Komnenos who wants a good trusted pike unit to stand guard against heavy horsemen. His victory at Sirmion over a Hungarian all cavalry army made him realize the need for a pike unit for the Roman army. Kontaratoi, while they lack a shield, they wear a “bambakion” gambeson padded cotton cloth and on top of that another gambeson, be it either another “bambakion” or “epilorikion”, quilted cloth, which can stop blunt trauma, but isn’t so good at stopping arrows not like metal is. The pike (Kontarion Makron) they wield in unison and the training it took to handle them effectively are a fear factor in battle, but these same pikes make them unable to run or maintain an effective defense if their flanks are not secure. A good commander will always have spear or sword units protect their flanks, while Kontaratoi in turn, protect the sword and spear units from heavy horsemen. They also keep infantry at a distance, when their flanks are properly supported. Originally Kontaratoi were spearmen, carrying a large oval shield. The destruction wrought upon the empire though during the Seljuk invasion and the Norman raids, obliterated them. Manuel Komnenos brought them back as pikemen to cope with the increasing number of heavy cavalry that the Roman Empire had to face both on the western but more so on the eastern frontier. Their training was intensive, much more so than their place in the Roman war machine would imply. They use a 12-16 feet Kontarion Makron. Kontaratoi were to be the last bearers of the long lost Hellenic tradition of the Sarissa pikemen, who by being the mainstay of Alexandros’ infantry and his Diadochoi, ruled supreme in the battlefield until the more fluid cohorts flanked and overwhelmed them. Kontaratoi were used extensively against heavy cavalry and when properly supported they won the day.